There is something about a group of powerful friends that make it something you want to be a part of.Â Everyone brings something to the table, everyone has all sorts of money and can do something fantastic, all the people are good looking.Â Itâ€™s a group like that which everyone is dying to be a part of.Â Now there is a new look available into the biggest political group of all time, the Kennedy family. Starting this August 26th, now available on DVD from PBS Home Video and Paramount Home Entertainment comes the definitive collection of the important and pivotal American presidents of the twentieth century.Â American Experience â€“ The Presidents Collection â€“ The Kennedys is ready to come into your living room and help explain why the twentieth century turned out the way it did.Â Bring home this wonderful historic show today. 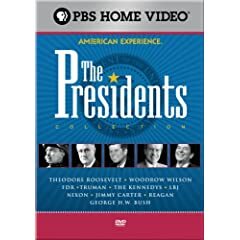 This DVD boxed set contains 15 DVDs and ten episodes from American Experience.Â The presidents examined are, in chronological order, Theodore Roosevelt, Woodrow Wilson, Franklin Delano Roosevelt, Harry S. Truman, The Kennedys, Lyndon Baines Johnson, Richard Nixon, Jimmy Carter, Ronald Reagan and George Herbert Walker Bush. This documentary is divided up into two discs, each one being just under two hours long.Â We see the meteoric rise of Joseph Kennedy through the money rich halls of Wall Street to his position as head of the SEC and an ambassador.Â His oldest son, Joseph P. Kennedy Junior was supposed to take up the political mantle of the family, but was killed on a volunteer mission flying over France.Â That left the next oldest, John F. Kennedy to take on political roles and we follow him all the way up to the presidency and his assassination.Â Bobby Kennedy was the Attorney General under JFK and ran for president himself, was assassinated as well, this time by Sirhan Sirhan (the first Palestinian most people ever heard of) and we learn about all this as well.Â Then thereâ€™s the baby of the family, Ted Kennedy whose run for president in 1980 ended in shame at Chappaquiddick but he remained a fantastic senator.Â This is an in-depth look at the whole Kennedy family, not simply one facet. The special features included in this DVD are an interview with historian and author Robert Dallek about the unfinished life of John Kennedy, a featurette which takes a deeper look into the Kennedy family and a teacher discussion guide provided to facilitate better discussions while watching this in school. Letâ€™s face it â€“ who has never wanted to be a Kennedy at some point in their life?Â Theyâ€™re all good looking and theyâ€™re fantastically talented and powerful.Â They are the royalty of America, although very much of a tainted dynasty, even at the height of their power.Â JFK was a visionary president who inspired a nation and mobilized a whole generation to help their country.Â Bobby Kennedy was a man who was able to appeal to our better selves and people across the nation before he was slain.Â Teddy Kennedy was on the path to the presidency when he was derailed by his own massive problems and realized that his life lay in being a Senator and so he became a great one.Â This film is a fascinating look at one of the most compelling families in American government. This DVD and the rest of the boxed set is available at Amazon.com. No user commented in " Movie Review: American Experience â€“ The Presidents Collection â€“ The Kennedys "